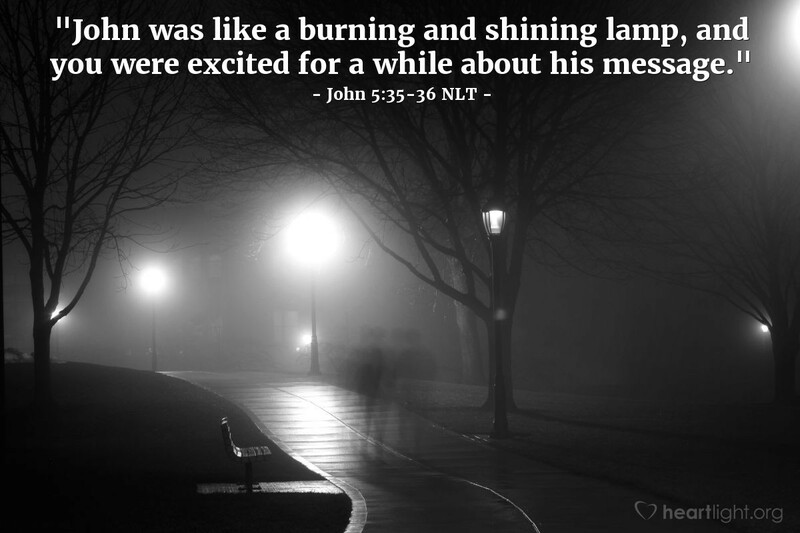 [Jesus said,] "John was like a burning and shining lamp, and you were excited for a while about his message. But I have a greater witness than John — my teachings and my miracles. The Father gave me these works to accomplish, and they prove that he sent me." How do you decide about Jesus? Is he just a good guy? Is he anything more than a great teacher? Jesus asks us to make a decision based on the witnesses to him, including his words and deeds. He asks us to listen to him. He invites us to examine his miracles. Then he challenges us to decide about him. Is he a blasphemer? Is he self-deluded? Or is he God's Son, the Messiah, and the Savior of the world? Of course, many of us made that decision long ago. Does that mean we should take that decision for granted? Of course not! Nothing builds our faith quite like spending time with Jesus in the Gospels. So why not rededicate some time this spring to reading through Matthew, Mark, Luke, and John? Look to Jesus' great witnesses, his teachings and miracles, to build your faith. Father, thank you for leaving a powerful testimony to Jesus in the Gospels. Thank you for the unique way each of these Gospels presents the story of Jesus. Build my faith and strengthen my commitment as I seek to get to know Jesus even better by studying his words and his mighty deeds. I pray this confidently in his name. Amen.